Assessment of civil infrastructure is a primary objective of institutions working in the field of building materials. By utilizing standard methods of material inspection as well as several partially self-developed methods of NDT, the department of building materials at the Technical University of Berlin with its affiliated chemical laboratory MBF [MBF] is capable to perform detailed inspections of complex mechanisms of structural damage and structural deficiencies to allow problem-oriented conclusions. This paper discusses a number of practical problems in civil structures as well as their solutions utilizing NDT methods. To ensure corrosion protection for reinforcement in reinforced concrete structures, standards define minimum concrete cover depending on environmental conditions. In a specific case, prefabricated concrete elements showed areas with concrete cover of less than c=20mm, which is the minimum value prescribed by the German standard for an exposed concrete with a minimum strength class of at least B 35, C 30/37 respectively. To assess the corrosion protection of the reinforcement, information about both distribution of the concrete cover and tightness of the concrete are required. Distribution of the concrete cover is obtained from a sufficiently large number of measurement values of an adequately-sized spot-check of concrete elements [DGZFP]. For the measurement, a computer-aided covermeter was used (fig. 1) with the advantage of automatically storing measurement values for subsequent statistical evaluation. Fig 1: Principle sketch of the covermeter. A measurement curve on the right shows a threshold value (dashed line) of 20 mm and the concrete cover of single bars. In a statistical approach the minimum concrete cover is considered as the 5%-fractile of the concrete cover distribution following the German DBV-guideline: "Concrete Cover and Reinforcement "[DBV]. Fig 2: The density function h(c) of the measurement values of concrete cover. The curve shows the best fit of the normal distribution. The approximation is insufficient!. Fig 3: The density function h(c) of the measurement values of concrete cover. The curve shows the best fit of the lognormal distribution. This approximation is also insufficient!. It turned out that neither the normal distribution (fig.2) nor the log-normal distribution (fig.3) fitted the measured data set particularly well. However, a linear combination of both distribution functions led to useful results (fig.4). The statistical evaluation showed that the 5%-fractile was only 1.5mm smaller than the value of c=20mm as demanded by the German standard. Fig 4: The density function h(c) of the measurement values of concrete cover. The curve shows the best fit of a linear combination of the normal distribution and the lognormal distribution. It is a fairly good approximation. The next step of investigations focused on the tightness of the concrete cover. A possible corrosion process of the reinforcement in a chloride-free environment can only be initiated if the front of carbonation reaches the reinforcement. The carbonation velocity depends on the diffusion coefficient of the concrete and thus on its total porosity and its pore size distribution. The concrete that had to be assessed belonged to the strength class B 45, which is corresponding to the strength class C 40/50. It is fair to assume that the tested concrete is less porous than a concrete of the strength class B 35. The total porosity was measured using a helium pycnometer. The result was pw=13.3Vol-%. Under normal environmental conditions, concrete with a total porosity of pw<16Vol-% is considered sufficiently durable. Also, the pore size distribution (fig. 5), determined by a mercury pressure porosimetry, showed its maximum in the range of small pores with radii between 0,01mm to 0,1m m. There were almost no large pores in the range between 10mm and 100mm. Fig 5: Pore size distribution in Vol.-% (right scale) and cumulative volume (left scale) of the assessed concrete. In this case, this procedure led to a rationally established assessment, which allowed the owner to accept the small deviation of the target. The small deficiency concerning the concrete cover is compensated by a higher tightness of the concrete that could be proven. Large areas of ceiling plaster suddenly peeled off the ceiling surface, resulting in damage to furniture and household appliances. Considering an average cover thickness of approximately 30mm and the resulting mass of about 33kg/m2, it is highly fortunate that no severe personal damage has yet been reported. Hence, this situation requires immediate action. 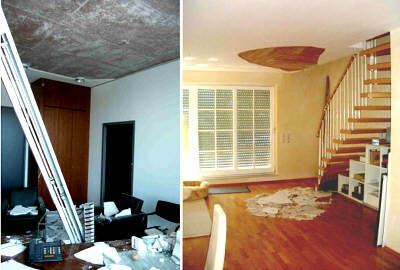 Fig 6: Large-area spalling of ceiling plaster in an office (left) and residential housing (right). Frequency of such damage has increased dramatically over the past years. These plaster covers have a thickness over 3 cm, which results in a unit-mass of more than 30 kg/m2, a value sufficiently high to cause se-vere damage to both people and interior. Identifying the cause of such structural damage along with the chronological development of an inferior bond between plaster and concrete are the subject of current research investigations. Durability of rehabilitation measures (adhesion, monitoring). Compared to areas of good bond, acoustic excitation in unbonded regions leads to higher levels of vibration, when excited by acoustics. This vibration is particularly pronounced at certain resonant frequencies and proves useful when excitation is performed by means of indoor speaker systems. At these frequencies, amplitudes of vibration in unbonded regions are more than 100 times larger when compared to regions of good bond. Surface vibration is recorded using a laser vibrometer with an arbitrary raster [SCHE1]. Extremely high measurement velocities may be obtained when using an automatically scanning system (30 min for 20 m2, raster width 1cm). Documentation of measurement results is near-perfect. However, given the high cost for this system, its amortization through the use for detecting damage in ceiling plaster is not attainable in the near future. A cost-efficient alternative to the laser vibrometer delivering sufficiently precise documentation of measurement results is obtained by combining impact testing with piezoelectric probes [HIL] and a microphone with an indoor positioning system. The hand-held piezoelectric transducer located in the sensor head inaudibly taps the plaster surface, while the microphone records the excitations (high intensity in debonded regions, low intensity in intact regions). Two cords are utilized to connect the sensor head to two surface-mounted displacement transducers, which allow precise location of the sensor head. A computer is used to record intensity of the acoustic signal and corresponding position of the sensor head. A color-coded representation of acoustic intensity throughout the surface corresponds to the mapping of subsurface voids. Precise resolution of void location allows comparative measurements at different time intervals, which may be used to comment on the progression of damage. Over a period of more than 10 years, one of the main research topics at the department of building materials has been the constant development of the Remanent Magnetism Method for the non-destructive location of prestressing steel fractures [SCHE2]. In this context, two topics have been of particular interest. One of them is the "Fast Location of Prestressing Steel Fractures in Bridge Decks and Parking Lots". Results of this investigation are presented in another talk, which will also be given at this conference. The other focuses on application of the RM Method to tendons located behind densely spaced mild reinforcement. Fig 7: The shown curve is the result of the difference between two experimentally obtained curves, representing different magnetic states. The bold line is the low-pass-filtered difference-curve, in which signals of widths significantly smaller than the width of a fracture signal have been suppressed. It almost exclusively contains signals originating from inhomogeneities (particularly fractures of single wires) of the tendons. Interference content is minimal. Due to edge-effects in data processing, either end of the curve (encased with dashed lines) cannot be interpreted. Signals corresponding to fracture can clearly be identified. Degree of damage and signal amplitude are correlated. Orthogonal to the tendons: Steel bars of Æ28mm are located at a spacing of 12.5mm. The average concrete cover is approximately 4.5cm. Parallel to the tendons, steel bars of Æ16mm are located at a spacing of 12.5mm. The average concrete cover is approximately 3cm. Using the magnet and following the processing steps, which worked satisfactorily with normally reinforced concrete units, location of prestressing wire fractures was unsuccessful on concrete units with an extraordinarily dense arrangement of reinforcement. This was mainly due to the fact that the magnetic screening of the tendon by the mild reinforcement prevented a considerable magnetization of the tendon. After the construction of a larger electromagnet specifically designed to adapt to the high degree of reinforcement, magnetization of the tendon behind the dense mild reinforcement was successful. After multi-level processing of the measurement data, which represent certain magnetic states of the entire reinforced concrete unit, fracture signals can be clearly identified and the corresponding wire breaks are thereby clearly identifiable (fig. 7). Insufficient concrete cover is a common occurrence. The example outlines the importance of not only measuring the concrete cover, but to further assess material properties of the reinforced concrete, such as concrete tightness, in order to comment on long-term durability. Despite being a simple task, the location of insufficient bond between plaster and concrete as well as the exact documentation of its distribution throughout an inspected region requires further development. The third example illustrates how the constant development of the Remanent Magnetism method can lead to successful application in finding fractures in prestressing tendons, even if applied in the most difficult situations. [SCHE1]Scheel, H.; Walther, A.; Hillemeier, B., (2001): Gipsputzdecken: Berührungslose akustische Prüfung des Verbunds mit dem Untergrund im DGZfP-Berichtsband 76-CD, Bauwerksdiagnose - Praktische Anwendungen zerstörungsfreier Prüfungen, Leipzig, Deutsche Gesellschaft für zerstörungsfreie Prüfung e. V.